On the lawns of a forest grazed a handsome horse. He was a fast runner. But, he was often frightened by a tiger that passed by now and then. One day, as the horse was grazing, a man passed that way. He asked the man, "Sir, aren't you afraid of lions and tigers?" The man laughed aloud and answered, "Me! Look what I have." He showed rifle and continued, "Should any animal approach me I can shoot and kill him." The horse asked, "If that is so, sir, will you help me?" The man replied, "Of course. I will. What will you do for me?" The horse said, “Anything you want of me, I will do." The horse told the man about the tiger. The man said, "If you let me saddle you and take you with me, you need not be afraid of the tiger." The horse was too happy. The man led the horse into town and left him in a stable. 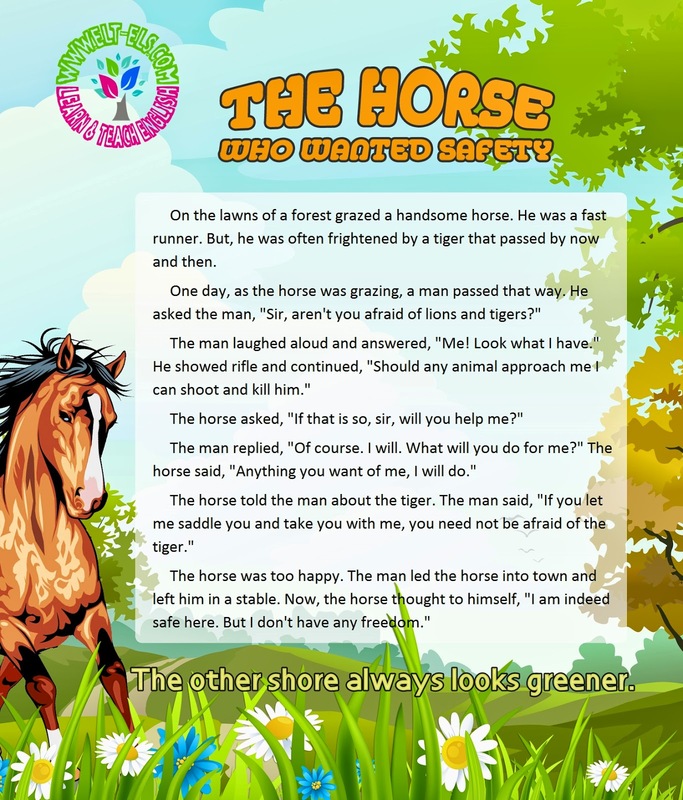 Now, the horse thought to himself, "I am indeed safe here. But I don't have any freedom." The other shore always looks greener.